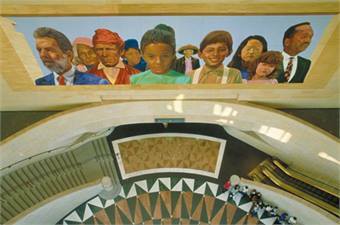 Union Station, City of Dreams/River of History, Richard Wyatt in collaboration with May Sun, Artists. Courtesy of Metro (Los Angeles County Metropolitan Transportation Authority). This summer, the Los Angeles County Metropolitan Transportation Authority (Metro) launches a new series of tours, Metro Art Moves_DTLA. The new series expands Metro’s year-round tour program providing creative explorations of stations in downtown Los Angeles. The Metro Art Moves_DTLA tours are a fresh, new approach that aims to increase transit ridership through volunteer docent and artist led experiences of the Metro system. Tours introduce riders to the agency’s diverse collection of 300-plus artworks, familiarize the public with the services Metro provides and highlight destinations served by rail and bus. The Metro Art Moves_DTLA tours build on Metro’s existing docent-led tour model, by adding artists to co-lead the tours. Metro Art worked with artist Sara Wookey to identify opportunities for local artists to amplify the docents’ extensive knowledge about artworks with activities that heighten tour-goer engagement and demystify the Metro system. The docents lead discussions, offering facts about the artworks, and the artists prompt ways of engaging with the Metro system through contemplative exercises, including stylistic techniques for using the TAP card and speaking secret words into a special voice-activated artwork at Union Station. Wookey’s artistic practice involves awakening people to the subtleties of public space and creating opportunities for participation in the urban landscape. Metro Art Moves_DTLA tours are designed to attract new transit riders by creating connections between the places where people live and work, and the bounty of culinary and cultural adventures spread throughout Los Angeles County. Metro Art Moves_DTLA tours present Los Angeles from new vantage points, heighten the rider experience in fun and engaging ways to boost public perceptions about riding transit, promote rider etiquette and offer opportunities for discovery. The tours reframe the experience of taking transit, giving riders the opportunity to explore little known cultural treasures, iconic landmarks and downtown’s thriving cultural scene. Established in 1989, the Metro Art program has commissioned more than 300 artists for a wide variety of temporary and permanent projects. Artists are selected through a peer review process with community input. All works are created specifically for their transit-related sites. Metro’s public art policy allocates 0.5% of project construction costs for art. RELATED ARTICLE: Check out, "Transit Art Optimizes Form and Function."